I ‘grew-up’ on Wood Nymph butterflies. They were among the butterflies I saw most often back in the 1990’s when I took to this pursuit gangbusters. They were abundant in Doak field (meadow) and the forest edges surround Doak. I counted them among my favorites at Raccoon Creek State Park in southwestern Pennsylvania. Why? In the mid-1990’s I took a several day outdoors course at Raystown Lake in central Pennsylvania. There, near lake’s edge, I saw a Wood Nymph butterfly with screamin’ baby blue in its forewing eyes, that surrounded by a large field of butter-yellow. I saw it, but minutes later, after following it, I had not a single image. I wanted an image of such a Wood Nymph, and I have come close. Try to approach a Wood Nymph, and you’re more than likely to be treated rudely, very rudely. The blue pupils in the forewing ‘eyes’ are replaced here with tiny white ones. All the 3 ‘eyes’ seen on the lower wing surfaces have those white pupils. The yellow washes of the northern Wood Nymphs are a bit smaller, and less intensely yellow. I think that they are still among my favorites, still. Years have passed since I happened onto Wood Nymph butterflies with sky blue eyespots. Those were at Raystown Lake in central Pennsylvania. They were speedsters and hid as soon as approached = no images! 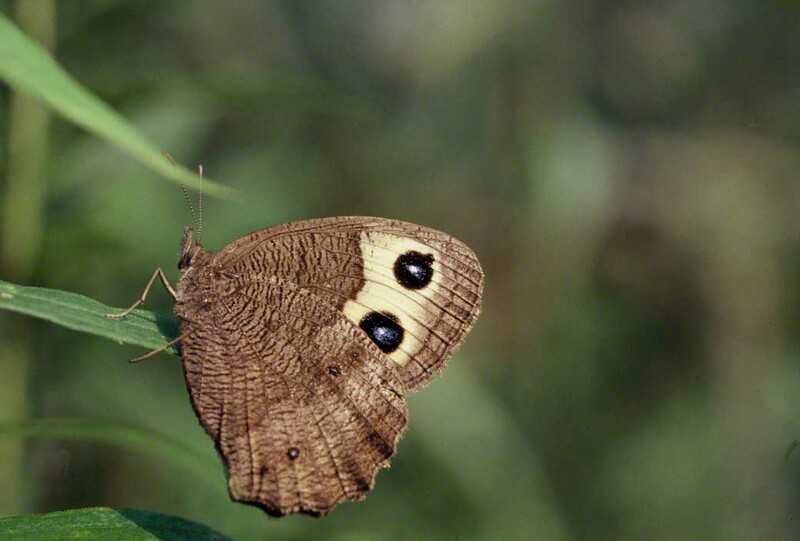 I’ve sought images of Wood Nymph butterflies that are fresh and show sky-blue eyespots. Not so easy to secure. They prefer trails at forest edges, especially with high grass fields adjacent. The fresh ones are gone in an instant, the worn ones, well they’re no longer striking brown, yellow yellow or baby-blue. So here we have all of the above. We haven’t posted an image of this butterfly with its wings fully opened because. they rarely bask in the morning sun and open their wings for nanoseconds at a time. I’ve been on the look-out for Wood Nymphs resting with wings open. Ten years later, I’m still looking.